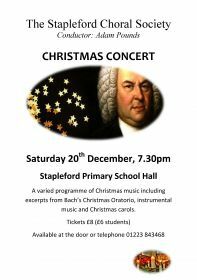 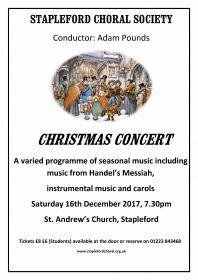 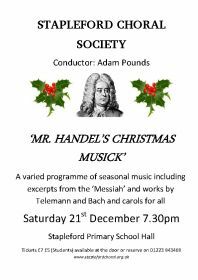 A varied programme of seasonal music including excerpts from the 'Messiah' and works by Telemann and Bach and carols for all. 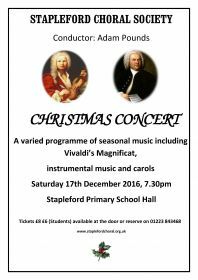 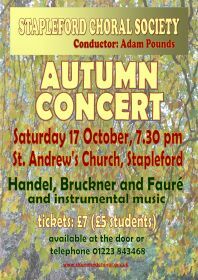 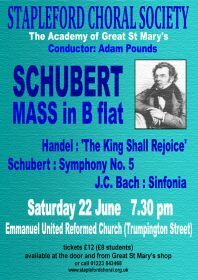 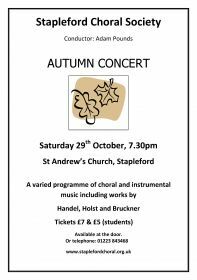 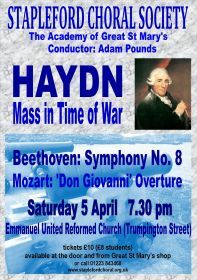 A varied programme of music including works by Vivaldi, Bach, Bruckner and Parry. 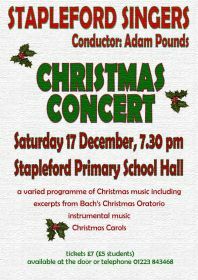 Please phone 01223 843468 for more information. 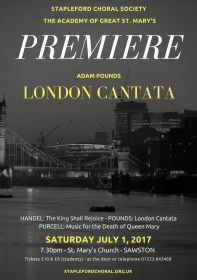 Our season finishes with an evening devoted to music by British composers. The Serenade to Music by Vaughan Williams is a firm favourite with audiences. 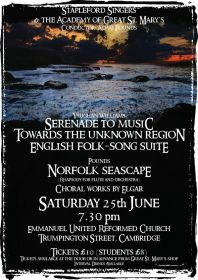 Perhaps less well-known is Toward an Unknown Region, a powerful and evocative work. 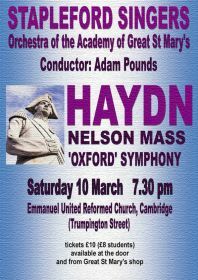 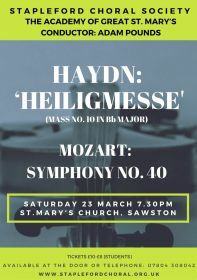 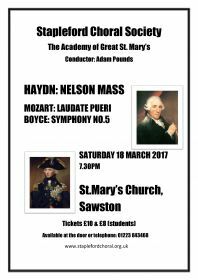 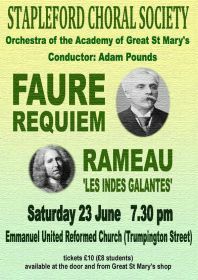 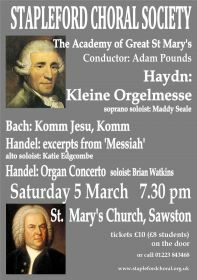 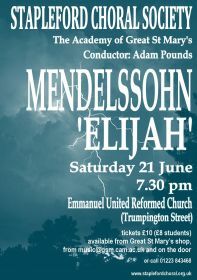 The choir will be joined for this concert by The Academy of Great St. Mary's and the orchestra will give the second performance of Seascape composed by our conductor, Adam Pounds. 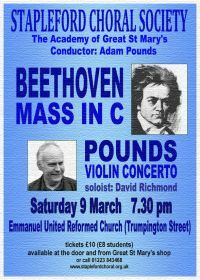 The flute soloist will be Dinah Pounds for whom Adam composed the piece. 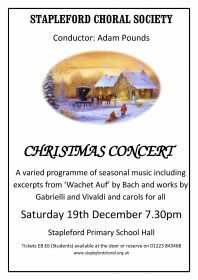 We look forward to seeing you at our concerts and hope that you will agree that we have a varied programme to suit all tastes. 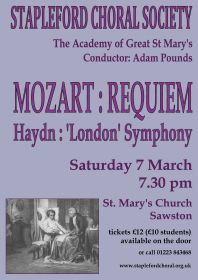 On Saturday 12th March the choir performed the Requiem by Mozart. 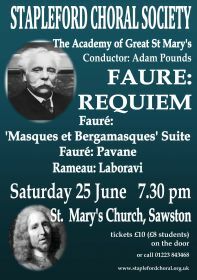 This is a compelling work and a concert that was not to be missed. 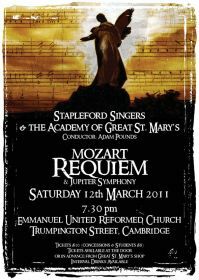 We coupled this with the last symphony that Mozart composed - the Jupiter - a wonderful piece that combines joy and melancholy in equal measure. 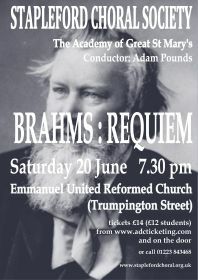 The Emmanuel United Reformed Church in Cambridge has proved to be a great venue both in comfort and acoustics.